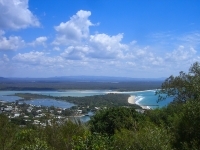 One of Queensland's fastest growing regions, the Fraser Coast is best-known as the home of Fraser Island and the Great Barrier Reef, two of Queensland's World Heritage Sites, and is the capital of whale watching in Australia thanks to the amount of giant humpback whales that frequent its waters. Boasting a rich and diverse natural beauty, the Fraser Coast region encompasses the areas of Fraser Island, Maryborough, Hervey Bay, Gympie, Cooloola, Tiaro, and the Great Sandy Strait. Prospectors should take a trip back in time and visit the old gold mining town of Gympie, where gold-diggers flocked and saved Queensland from its severe economic depression in 1867. Visitors can also admire the beautiful colonial architecture of the charming Victorian town of Maryborough, visit the Mount Walsh National Park, watch loggerhead turtles hatching on Mon Repos Beach from January to March, feed the dolphins breakfast in Tin Can Bay, or simply relax with a good book on the stunning stretches of sandy white beaches. The UNESCO World Heritage Site of Fraser Island is by far the region's most popular attraction. The largest sand island in the world, Fraser Island's pristine freshwater lakes and creeks are the perfect place for nature lovers to escape for a bit of peace and quiet, while the verdant rainforests are juxtaposed with swampy wetlands and the coastal strands of Pandanus palms. Keen fishermen should take a trip to Hervey Bay where monsters like garfish and marlin can be hooked, as well as red emperor, barramundi and mangrove jack. Hervey Bay is also the best place to view the awesome humpback whales as they make their annual migration south from July to November. With endless activities and a good range of natural and man-made attractions to visit, it's not surprising the Fraser Coast is becoming one of Australia's premier holiday destinations. We are looking for contributors for our Fraser Coast travel guide. If you are a local, a regular traveller to Fraser Coast or a travel professional with time to contribute and answer occasional forum questions, please contact us.